I may have bored you before with stories about Data Visualization. It is one of my favorite topics. We deal in data. And visualization of data can help to increase the value of the data tremendously. Proper visualization provides quicker insight and reveals the true meaning of the numbers in an instant. 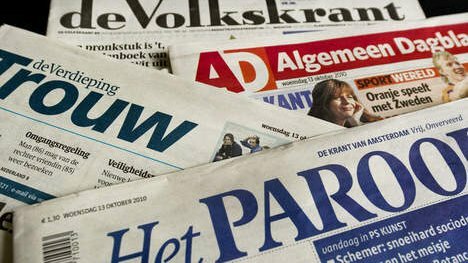 Newspapers frequently use graphics to illustrate the news reported in their articles. My morning paper has a broad palette of ways to represent numbers, trends, aggregates and incidents. 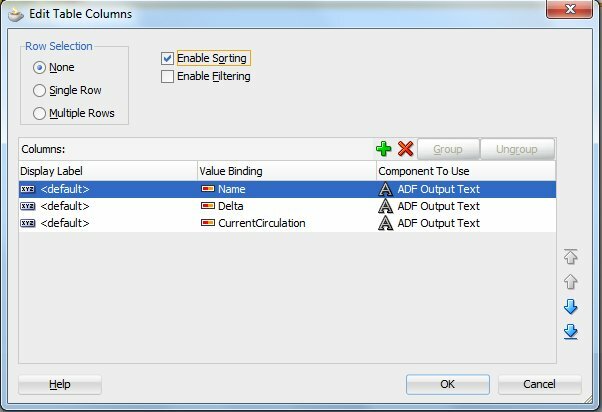 It inspires me to mimic in my own toolset: ADF. 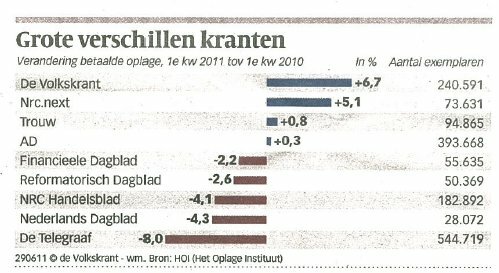 The other day, my newspaper printed the next figure that illustrates the changes in circulation for all Dutch newspapers – comparing the 1st quarter of 2011 with one year ago. I quite like this presentation. It reveals a lot of information in an appealing way. I started wondering it this way of presenting changes would be easy to implement in ADF Faces applications. My first port of call obviously was the ADF DVT (Data Visualization Tags) library. However, it did not seem to offer a graph type that is very close to this presentation. Gauges appeared to come closest, but not quite there. And the inline-display inside table rows is related to spark charts, but again, it is not quite the same. 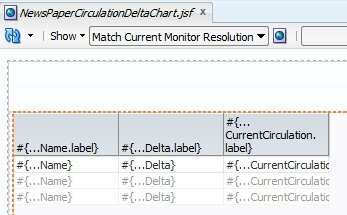 Before creating the – data bound – Delta Graph display, I needed to create a data set that I could work with and bind the table to. 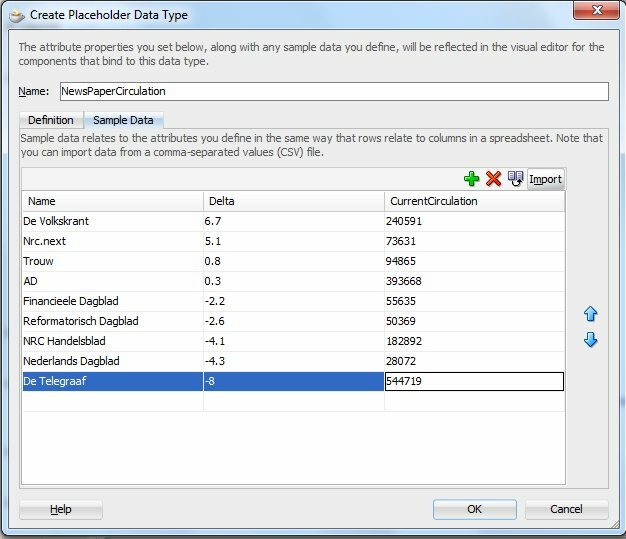 The easiest way of doing this was through the use of a Placeholder Data Control – that allows we to work with data that to the application appear like data from an enterprise resource such as a web service or a database but that in fact is typed in or read from a CSV file. Next I created the web page with data bound table – based on the circulation records from the placeholder data control. Then, the essential step, I manipulated CSS properties until I achieved the desired effect. Creating a Placeholder Data Control is done from the New Gallery. The configuration wizard appears, asking for a name for the Data Control. 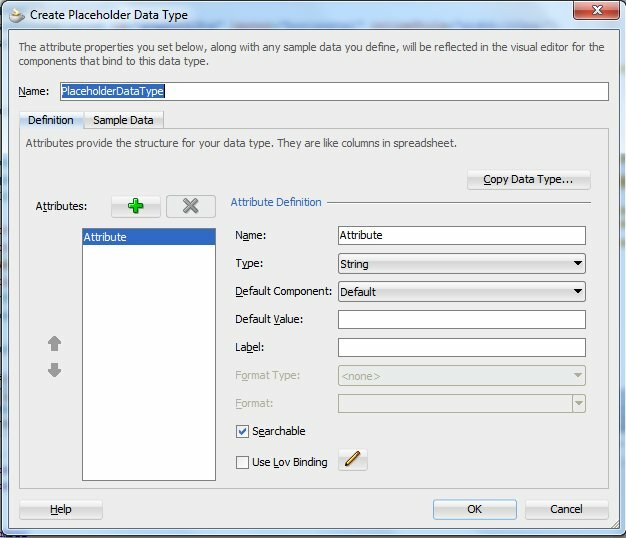 The next step is the definition of the Placeholder Data Type(s). 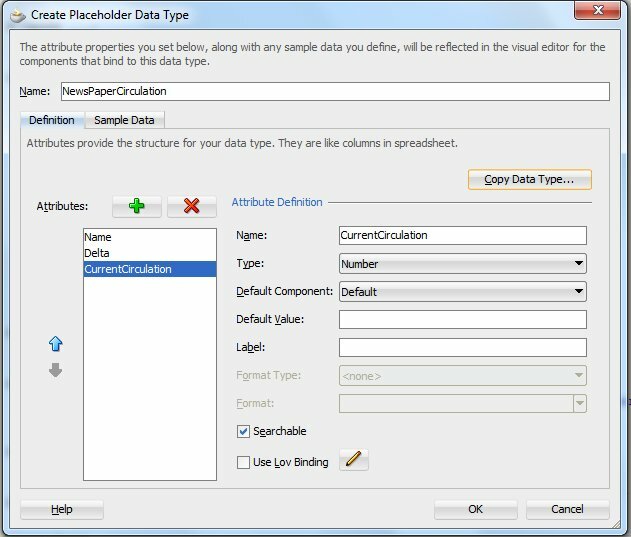 Provide the name of the Data Type and the names and types of the attributes. For each attribute, UI properties such as Label and Format can be specified. 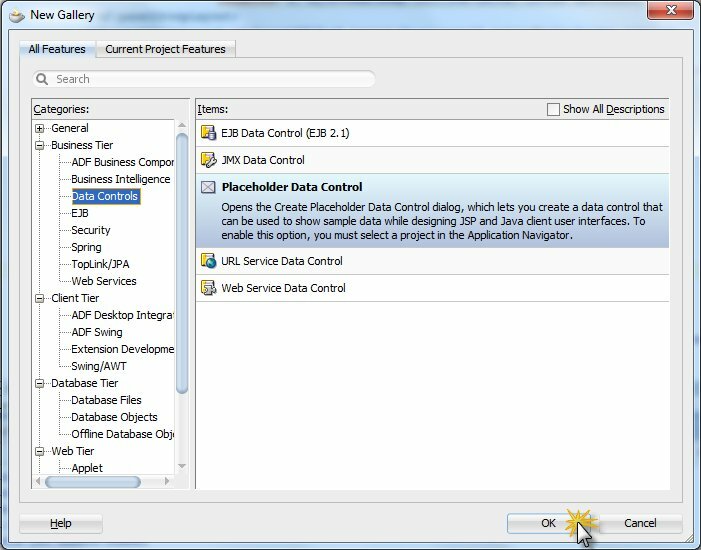 Switch to the Sample Data tab to register the data that this ‘dummy’ data control will feed into the ADF Binding framework. This data can be typed in or read from a source file. Close the wizard with the OK button. 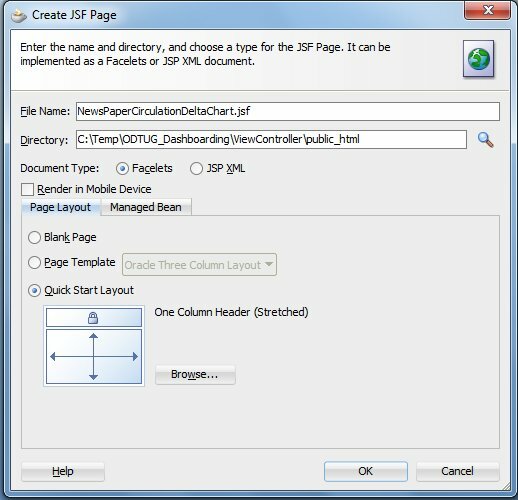 Press OK to complete the wizard and create the data bound table in the page. 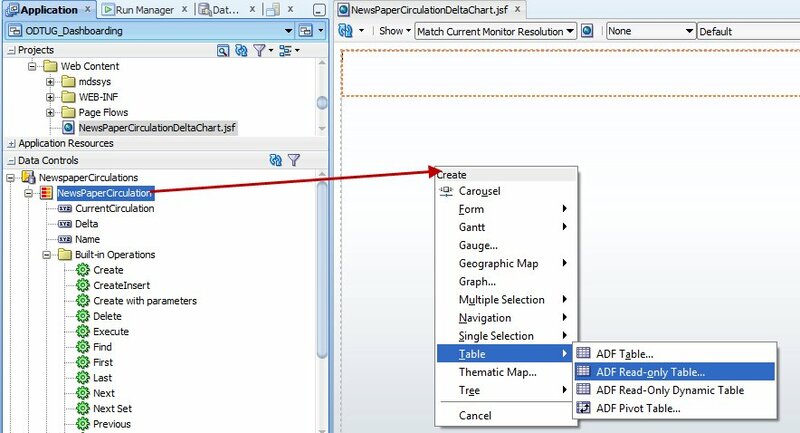 At this point, you can run the page and you will see the data from the placeholder data control presented in the web page in a rich ADF Faces table. The Delta Graph display relies on a combination of ADF Faces components and their CSS properties. In addition, there are two methods used on a managed bean – one to answer the question whether or not a delta-value (an instance of oracle.jbo.domain.Number) is above zero and one to calculate the width of the bar – given the delta value, the maximum width and the maximum delta value. I have tried here to make use of the EL 2.2 specification that allows use of parameters and custom functions in EL expressions. However, I could not get this to work with WebLogic 10.3.x and JDeveloper 11gR2. The OTN Forum and other websites suggested similar problems as the ones I ran into – but none of the suggested solutions helped me out. I have used a somewhat awkward approach to calling custom functions from EL expressions – a workaround using a Map implementation; it does the job, but I am sure today there are better ways to doing this. <af:outputText value=" " id="deltaMin" clientComponent="true"
<af:outputText value=" " id="deltaPlus" clientComponent="true"
I hope that this article provides a starting point for experimenting with this type of Data Visualization. Perhaps the Oracle ADF DVT team could consider creating something in their vast collection of data visualizations – or perhaps point me in the direction of an existing component that can do something like this. 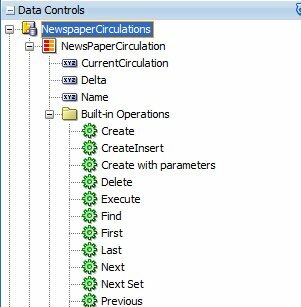 Download the JDeveloper 11gR2 application with the sources from this article: DeltaGraphAndODTUG_Dashboarding.